In a city so riddled with churches as Kraków, any tour of the old town can often be an overwhelming series of medieval Christian buildings that seem to meld into each other. Not so with Grodzka 54, where the fancy baroque structure of St. Peter and Paul’s Church sits back from the street, behind a terrific set of railings and late baroque statue pieces that ooze a mystery and arcane charm like no other frontispiece in the city. While not as old as its near neighbours, like the medieval Basilica of St. Mary in the Old Town Square, and the Wawel Cathedral on the castle hill to the south, the Church of St. Peter and Paul, still commands a rich historical place in the story of Kraków. In the late 16th Century a lot of European money was being directed at church building in the continent’s major cities as a way of fighting the influence of the reformation there. Kraków was no different, and one of the products of Catholic patronage from this period is this, the magnificent, early baroque Church of St. Peter and Paul, in the southern part of the Old Town. From outside, the visitor is immediately drawn to the striking metalwork and sculpted statues of the twelve apostles, but these are actually 18th century additions by the Polish artist Kacper Bażanka – who designed the plinths and railings – and the German Dawid Heel – who completed the marble figures in 1722. The frontispiece of the building itself is actually quite unique in Kraków, and is a prime example of increasing Italian architectural influence across the continent. 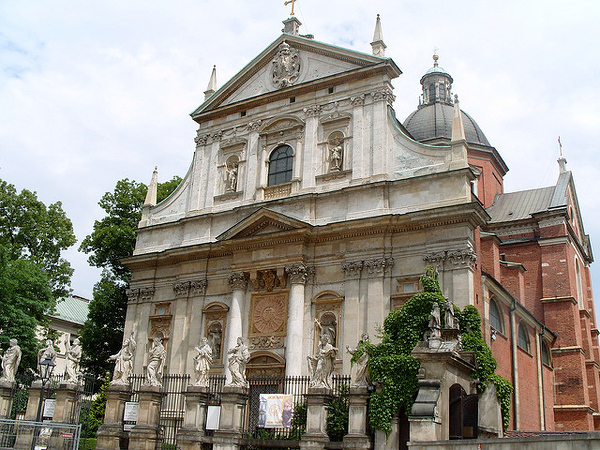 The influx of the baroque style to Kraków can be seen as a precursor to the Renaissance art that was to flood the city’s major sites throughout the 16th, 17th and 18th centuries, and the Church of Peter and Paul is the earliest example of this. Most notable perhaps, is the absence of a tower on the frontal façade, a stark change from the gothic architecture that makes up Kraków’s other famous churches. What’s more, the church on Grodzka is finished with Italian marble, and not the red-brick materials that were favoured by Polish medieval architects before. Inside, the Italian artistic theme largely dominates, with stucco decorations made by Giovanni Battista Falconi, depicting scenes in the lives of the church’s eponymous apostles, St. Peter and St. Paul. There’s also a magnificent baroque altar piece and, one of the church’s main attractions for fans of Polish history, the crypt of Father Piotr Skarga; who was a monumental figure in Polish academic and religious history, and priest to the King Sigismund III. Today, owing to its fantastic acoustics, the church is used as a concert hall for classical and baroque ensembles, while visitors can enter during the day to see the interior and subterranean crypts. This fine example of baroque Polish Church architecture, amidst a sea of the gothic and medieval, is a great way to add a different flavour to any sightseeing journey through Kraków’s old town.